The Challenge: Read any book that supports your healthy lifestyle. Define “health” as broadly as you need to improve your life — physically, mentally, emotionally, or spiritually. The Dates: This challenge runs for the whole year, January 1, 2015 to December 31, 2015. Sign up any time during the year. If you’d like a shorter-term challenge to get the year started off right, check out the New Year’s Resolution Reading Challenge. You don’t have to be a blogger to participate. Feel free to link to your Goodreads review or put a review in the comments on the Health Books 2015 Reviews page. 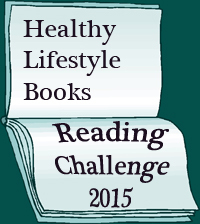 Books counted for other challenges can count for the Healthy Lifestyle Books challenge, too. I suggest two of the challenges that inspired this one: The Foodies Read Challenge hosted by Vicki of I’d Rather Be Reading at the Beach and The Nonfiction Reading Challenge hosted by The Introverted Reader. We’ll use #HealthBooks on Twitter for discussion and to share links. The link-up below is for sign-up posts. Please consider writing a sign-up post — it helps encourage others to join us! Link book reviews at the Health Books 2015 Reviews page. A link to that page will remain in the top menu of Joy’s Book Blog all year so that you can find it again. Questions? This is my first time hosting a year-long reading challenge. I might have missed something…. Hmm. I wasn’t planning on joining any challenges, but this one sounds so useful. I’ll have to think about it. Oh, and everything looks fine! I’m doing Foodies Read of course :), and the Non Fiction challenge. I have to sign up for this one. If fits in perfectly with my 2015 health challenge. I originally was going to go with 5-9, but decided to challenge myself with 10-14. This sounds nice, Joy! I think I’ll jump in, after I take a glance at the vaste suite of books my fiancé & I own. I don’t read nutrition or sports (he does) but I think like you: health is spiritual and emotional too. I wouldn’t cheat by using any novel that makes me laugh or smile but will see which ones really reach me or stand out. You kindly commented at my blog last year and I was pleased to recriprocate. I believe you’ve enthusiastically commented about my three groups at the blogs of some participants. Same as your program: join any time! My year has only just begun in February.